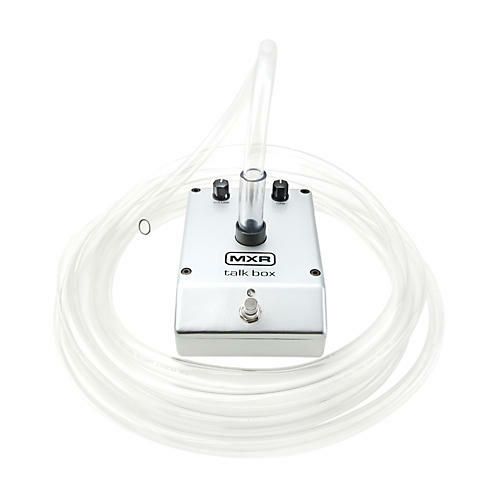 Channel the '70s rock sound with this modernized Talk Box from MXR. The Talk Box is a classic effect-you can hear it on some of the greatest songs ever recorded, across genres and time, from funk and '70s rock to hard rock and metal. Its unique, highly expressive character is instantly recognizable. The MXR team has fine-tuned the Talk Box for modern gigging convenience and tone sculpting while maintaining the unmistakable sonic character that made the effect legendary. With its own amp and speaker driver, the MXR Talk Box is compact and pedal board-friendly-you don't have to lug around a separate rig or patch into your amp's speaker output. And with Volume, Tone and Gain controls, you can shape and add texture to your Talk Box voice for maximum impact. Like all MXR pedals, the MXR Talk Box is built into a sturdy, road-ready housing to endure the rigors of the road. Includes an 18-volt power supply, an 8' surgical tube and a mic stand clip. There's always space on your pedal board. Order now!